Widened Steelies: Yay or Nay? Ever since I can remember, I've loved the look of widened steel wheels, aka "steelies." However, I've never pulled the trigger on a set for a couple of reasons. First off, they're going to be heavy, which won't do much for performance. Secondly, I'm not a huge fan of having my tires rub the fenders, and since the Yaris is pretty picky on offset, I figured no wide steelies for me. On the other hand, why do I need a light-weight wheel? I'm not tracking the car. And secondly, a little rub might be OK, so long as you're not ruining your tires (or your fenders). I'm not big into the stance/hellaflush thing, but I suppose you don't have the stretch the crap out of the tire to get a cool look. Hot rodders and VW guys have been rolling on widened steelies for years. 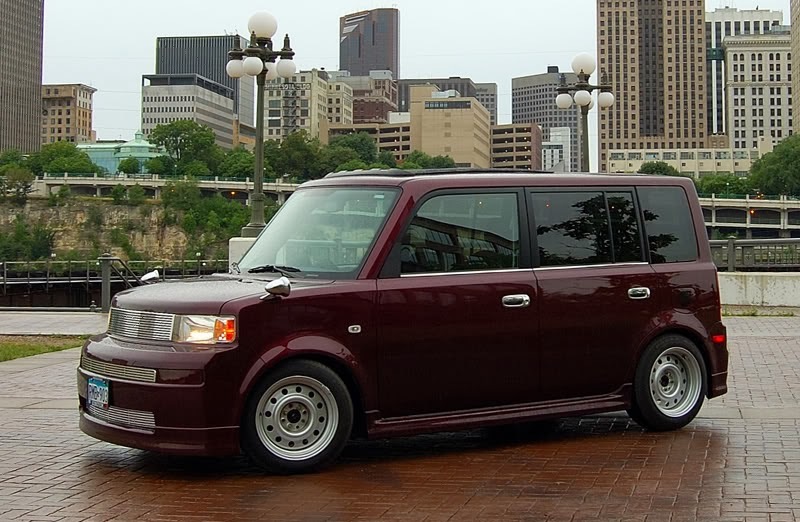 In 2005, I posed the widened steelies question on ScionLife.com, and the thread is 22 pages long. 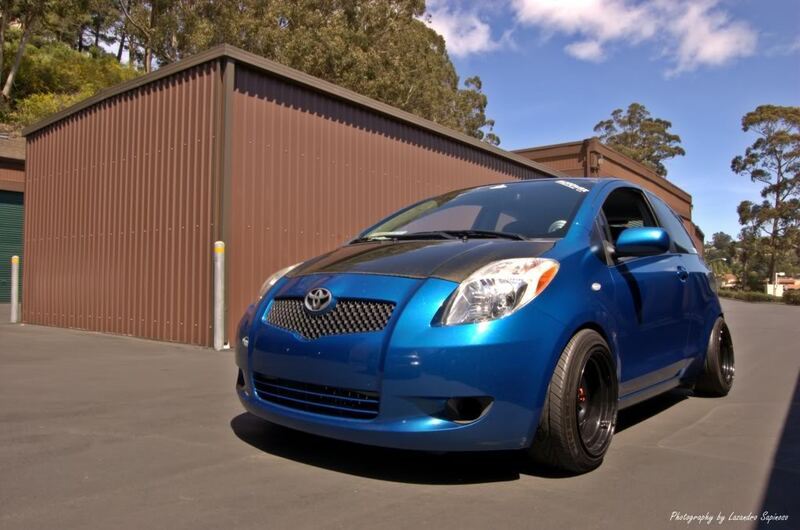 I still think a set of 15x7.5 steelies, maybe painted orange (or just silver) might look pretty badass on the Yaris. Since we don't often carry more than two people in the car it'd only rub occasionally. It might look cool. Then again, to pull the look of you typically need to be slammed, which I am not. I am lowered a bout 2", but there's still some fender gap. I'm not a big fan of the Daimond Racing steelies for use on the street. They look a bit too much like stock car wheels, and from what I understand, they're pretty soft and aren't really for street use anyway. 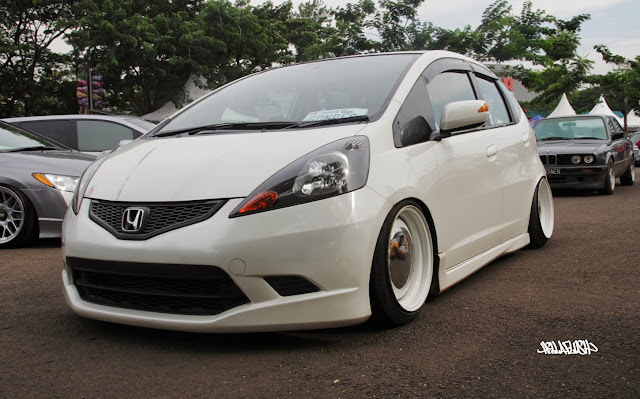 If I were to do it, I'd have a stock set of Yaris or Honda Civic steelies widened. So what do you think of the widened steel wheel look? Yay or Nay? I like the xB the most of the ones you posted; it looks *almost* stock. Myself, I wouldn't compromise turning circle - it is one of the Yaris' best attributes, after all. Do it! I say go for smoothies with a nice chrome center cap and just wide enough to notice. Performance hit? Dude, it's a Yaris! Get over yourself and have some fun. I think the clean, sleek, and just slightly retro look would be awesome, and something you don't see every day.